Minding our own business the other day, we had turned for home on another of those salutory jaunts through the neighborhood under threatening skies when we spied this gorgeous creation. Royal Enfield. Posing under gray skies. From our vantage point across the street, we could not read the lettering on the gas tank but the Olympus E-PL1 had no such trouble aided by a Lensbaby Twist 60. The Twist 60 is not designed for Micro Four-Thirds cameras. It's intended for full frame dSLRs which have a large enough sensor to capture the swirling backgrounds it creates. But the kit lens for the Olympus only runs out to 42mm so being able to reach 60mm is an advantage we couldn't pass up. We simply attached the Nikon mount to a Lensbaby Tilt Transformer to mount it to the Olympus. That gives us a 120mm 35mm equivalent. The light from the overcast sky was perfect. The garage door itself faces toward the west, where the sun was lighting up the clouds. 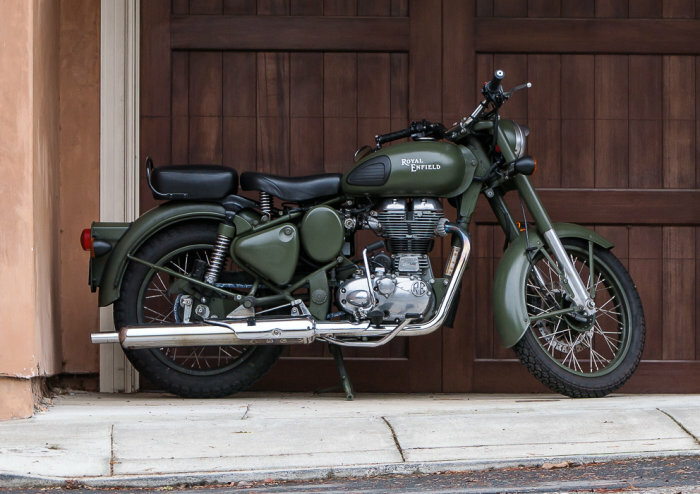 The Classic Battle Green comes to you with a paint scheme reminiscent of the War era, a time when Royal Enfield motorcycles proved their capabilitities and battle worthiness by impeccable service to soldiers. Donning a younger look with styling cues one would expect only from a genuine Royal Enfield: single cylinder air-cooled pushrod engine 1950s style nacelle and toolboxes, traditional paint scheme and buffed engine components, this motorcycle is all set to bring you the pleasures of modern motorcycling while reflecting the aura of classic eternal styling. Here's a photo of a restored ancestor of the modern recreation. The Raw capture was converted to DNG on import and, starting with a Lightroom preset designed to mimic Capture One Pro's default settings (which are a little more aggressive than Lightroom's), we added some Clarity and opened the Shadows a bit. We liked the result so much we thought we'd share it with you via a rare Sunday story. Mike, I was born in England and as a teenager in 1964 I owned a Royal Enfield 350cc Bullet. It cost me £8 (about $15) and was pushed to my house by the seller and his (I think) brother. While my mom made them cold drinks and a sandwich, I stripped out the fuel filter and cleaned it. I got the bike started while they were still at my house -- what a bargain.